3.1 The Proposal attached to these Terms and Conditions shall remain valid for a period of 0 day. 4.3 If the Customer fails to make any payment within 0 day of it becoming due, the Supplier shall be entitled to charge interest at the rate of 0.01% per month on the outstanding amounts. 5.1 Any date of delivery specified by the Supplier is an estimate only. Time for delivery shall not be of the essence of the contract and the Supplier shall not be liable for any loss, costs, damages, charges or expenses caused directly or indirectly by any delay in the delivery of the Goods. 5.2 All risk in the Goods shall pass to the Customer upon despatch. 8.4 All products are subject to the manufacturer's warranty and no additional guarantees are given or implied. Nothing in this clause affects your statutary rights. 9.2 The Customer may cancel an Order by notifying the Supplier in writing at the address above or by email before despatch of any goods and any moneys paid will be refunded in full. 13 GOVERNING LAW These Terms and Conditions shall be governed by and construed in accordance with the law of England and the parties hereby submit to the exclusive jurisdiction of the English courts. 14 ADVICE FOR CUSTOMERS WISHING TO RETURN ITEMS. I want to return my goods, what are my rights? Is it true that a high street shop does not have to accept non faulty returns? Non Faulty Goods do not have to be accepted for return under the law, but he good news is that most retailers, including Digitrains Ltd, choose to provide a 'goodwill' returns policy offering an exchange, refund or credit note for some returns. This strictly only applies to perfect unused items in their undamaged original packaging that can be resold as new. They must be accompanied by proof of purchase and be within 30 days of the date of purchase. And if your item was bought online, over the phone, or by mail order you have additional rights to return it under the Distance Selling Regulations. Where the regulations apply the consumer now has a “cooling off period” of 7 working days from receipt of the goods within which to cancel the contract and return the goods unused without penalty and for any reason. If the consumer has paid any money before exercising the right to cancel, a full refund has to be made as soon as possible and in any event within 30 days. The calculation of a working day excludes weekends and public holidays. You can only return non-faulty goods for an exchange or refund if the retailer has a returns policy. (See Above). Shops don't have to have a returns policy, but if they have one they must stick to it. Under the Sale of Goods Act you have a statutory right to return something and get your money back if it's faulty. Returns policies are usually displayed on receipts, on signs in-store and online. You can also ring the shop's customer services line to find out its returns policy. Most retailers impose time limits for returning non-faulty products, such as 28 days, but many extend around Christmas for example, so you might have more time than you think. If you paid by credit card, you also have extra protection. The items that can't be returned Most retailers have policies which stipulate that they will accept non-faulty returns, as long as items are unused and in perfect condition with their undamaged original packaging. Non faulty items must be accompanied by the original receipt or acceptable proof of purchase, see below. But there are some returns exceptions worth knowing about. DVDs, music and computer software Many retailers refuse returns if the seal or packaging has been broken. Perishable items You won't usually be able to return an item if it's perishable. This includes food and flowers. Made to order If an item has been made to order or personalised it's very unlikely that you'll be able to return it. What to have when returning items Depending on a retailer’s returns policy some will only exchange or give you a credit note, while others will give you a refund. But all shops usually require a few key things. A receipt. Always keep your receipt and take it with you. If you’re buying a gift for someone else, ask for a gift receipt so that they can change it themselves. The card you paid with If you paid for an item on a debit or credit card, take it with you when you return the item. This is especially important if you want a refund as its often credited to the card you paid with. The original packaging. We’ve said it already, but don’t underestimate the importance of taking the item’s original packaging with you. Non faulty items will need to be resold to someone else in perfect condition, Obviously if this condition cannot be met the item will not be acceptable for return as unsuitable for subsequent resale. If you simply change your mind, the retailer has no legal obligation to give you you money back, should you return an item without a receipt. However, many stores will offer an exchange or credit note, so its always worth asking. If your goods are faulty and you don't have the receipt, you still have the same rights to a repair, refund or replacement as under the Sale of Goods Act. I’m only the retailer – Am I responsible for faulty goods? Yes. The law clearly places an obligation on the seller selling goods in the course of a business to sell goods of a satisfactory quality (see below). This is known as strict liability and cannot be avoided, say, by referring the customer to the manufacturer under the terms of the guarantee. A guarantee or warranty will always be in addition to consumers’ statutory rights and those statutory rights can never be avoided. So, if a consumer has a complaint that goods are not of a satisfactory quality, their complaint is against the retailer. It is then up to the retailer to pursue the suppliers or manufacturers for damages on an indemnity basis subject to any terms and conditions of any supply contract. Furthermore, since 31 March. Furthermore, since 31 March 2003 the retailer may be liable for any “public statements” about the goods that are incorrect even though those statements are made by the manufacturer, importer or producer. A consumer may request either a repair or replacement from the retailer. This is often done by agreement anyway but is now a legal entitlement. If the retailer agrees to a repair or replacement, this must be done within a reasonable time and without significant inconvenience to the consumer. The retailer would have to bear any related costs. The retailer could refuse either of these requests if he could show one was disproportionately more costly in comparison than the other. Any replacement will have to be on a like for like basis rather than new for old. A consumer seeking a replacement for a faulty washing machine after, say, 4 months or even 14 months would be entitled to something comparable (but in working order, obviously) – not a brand new machine. A repair or replacement may not be possible for whatever reason or declined by the retailer as too costly. Alternatively, the retailer may have agreed to a repair or replacement but the consumer feels that is taking too long. In those situations the consumer may then request either a partial or full refund to reflect the loss they have suffered. A full refund, particularly after a lengthy time from the time of sale, would be rare. The consumer would have had, at least, some use of the goods so a reduction of the purchase price (a refund) would be calculated accordingly. The Sale and Supply of Goods Act 1994 introduced the requirement that goods be of a satisfactory quality. This section of the Act applies only to sellers who are acting in the course of a business. The Act sets out a list of criteria to be met for goods to be of a satisfactory quality. In order to satisfy that test, regard must be had to the following: Fitness for all the purposes for which goods of the kind in question are commonly supplied. If they decide that they no longer want the item It is important to remember that these regulations and, (subject to certain exceptions) most other “consumer rights” will only apply where goods are not of a satisfactory quality, or, do not conform to the contract. That is to say, the goods are faulty. Consumers do not (generally) have the right to reject goods or claim any of the rights discussed here and elsewhere, simply because they have changed their mind or no longer want them. Neither would a consumer have a claim where the fault complained of was nothing more than normal wear and tear, to be expected of particular goods in particular circumstances. Whilst it is true that consumers have 6 years within which to bring a claim under UK legislation, that does not mean that simply because a fault develops within 6 years the consumer would be able to bring a claim. Goods do not have to last for 6 years. Obviously, some goods are not intended to last that long. In other cases, component parts may simply need replacing. If that occurs through normal wear and tear or an intervening act, such as misuse or accidental damage by the consumer, there will be no basis for any claim against the retailer. Any guarantees given by (usually) manufacturers will be legally binding against the manufacturer notwithstanding they are “given free” and a consumer will be able to enforce it through the courts. The guarantee will take effect from the time that it is delivered. Digitrains Ltd do not provide additional warranties of their own for third party manufactured products. Where such guarantees are given for goods being sold in the UK they must be written in plain, intelligible English, must be available for viewing prior to purchase and state that they do not affect the consumers’ statutory rights. Local trading standards departments and/or the Office of Fair Trading have powers to investigate any complaints that guarantees do not meet the above criteria. Digitrains Ltd will reimburse the return cost at our standard despatch rate ( i.e. what it would cost us to send it to you in the first place, for example Royal Mail first class recorded within the UK ) for items returned as faulty under the SOGA. Return costs for non faulty or broken goods for repair will not be reimbursed, In these instances the customer will be responsible for those costs. A range of unique sound files, painstakingly recorded by Paul Chetter, Tony Molyneux, John Gay and Engineman that literally bring your models to life! 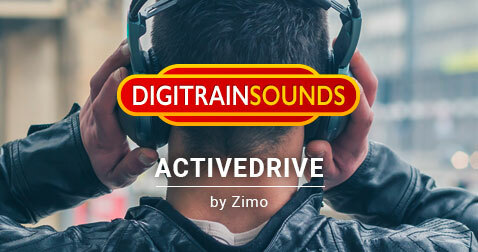 Our YouTube channel contains a plethora of videos demonstrating our range of products, including our highly requested ActiveDrive sounds.